The Edwardsville Regional had eight schools competing towards the sectional meet next weekend at Quincy. From the outset on a glorious day fit for running, it appeared as though several top squads held out key members. But regardless there was enough quality to keep the fans entertained. The Girls race was led by Edwardsville ace junior Abby Korak, who captured another regional title. The rest of the field was aggressive early on in the race, pushing a 5:45 first mile with Belleville East runner, senior Hannah Eastman, leading the pack. The aggressive move by Eastman threw Korak off a bit, but the home course advantage proved to be strong as Korak progressed along the challenging course now leading going through the two-mile. Korak gave what she described as an all-out effort, finishing in a time of 18:49. Eastman held on to second place to finish with a time of 19:16. Edwardsville teammate, senior Hannah Stuart placed third in 19:30, followed closely by senior Lydia Kurfman of Quincy, who finished in 19:31. Edwardsville was dominant in team running, as they had four runners cross the line consecutively from eighth to 11th place, all within just a few seconds from one another. The 31 point total easily captured a team title, while Belleville East was the runner-up (51pts). Rounding out the top six teams to advance to the sectional meet were O'Fallon, Quincy, Granite City, and Belleville West. Advancing as individuals were Maggie Fitzgerald (So., Collinsville), Sophia Paschal (Fr., Alton), Jessie Markel (Jr., Alton), McKenna Laing (Jr., Collinsville), and Ashley Sanchez (Jr., Collinsville). 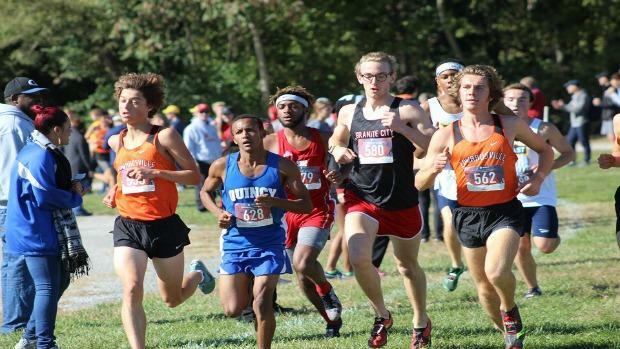 In a race where Edwardsville did not run their full varsity team, the rest of the boys' team stepped up. Max Hartmann, in particular, made a strong impact. For the majority of the race, the senior from Edwardsville ran with his teammate Roland Prenzler (Sr), who went on to win the race, only losing him slightly in the last mile, but remained aggressive to secure a third place finish on his home course in a time of 16:02. That time was over a minute faster than the time he recorded on the same course earlier this season when he placed seventh in 17:05 at the Edwardsville Invitational. Prenzler finished in 15:49. Fiker Rosen (Fr) of Quincy also left it all out on the course, placing second in 15:56. The young runner hung tight with a pack of leaders through the first mile and never broke contact. As former regional champ Andrew O'Keefe (Sr) of Granite City began to fall off from the two Edwardsville runners through the second mile, Rosen surged ahead and continued to make moves through the last mile of the race, never settling for where he was positioned among the field. O'Keefe placed fourth in 16:15. Another Edwardsville runner, Zach Walters, followed behind him, placing fifth in 16:29. As a team, Edwardsville won their fourth consecutive regional title (30pts), while Belleville East placed second (65pts). Among Belleville East's top finishers were Byron Jones (Fr) and Zachariah Panek (Jr), placing seventh and eighth consecutively, and Michael Megna (Jr) and Reed Wilks (Jr), placing 14th and 15th. Jones (Fr) recorded a time under 17 minutes with 16:49 on the clock. The two teams will move on to the sectional race, along with O'Fallon, Granite City, Quincy, and Collinsville. Individuals moving on to the sectional meet, not on a qualifying team are Cassius Havis (Jr-Alton), Dillon Rule (So-Belleville West), Jay'ion Harrison (Jr-Alton), Tim Carter (Fr-Belleville West), and Justin Goerger (Sr-Belleville West).